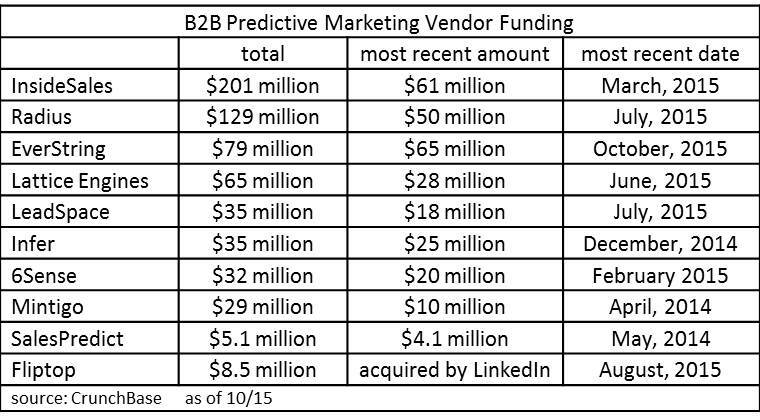 It’s clear that 2015 has been the breakout year for predictive analytics in marketing, with at least $242 million in new funding, compared with $376 million in all prior years combined. But is it possible that predictive is already approaching commodity status? You might think so based on the emergence of open source machine learning like H20 and Google’s announcement today that is it releasing a open source version of its TensorFlow artificial intelligence engine. Maybe I shouldn't be surprised that predictive marketing vendors seem to have anticipated this. They are, after all, experts at seeing the future. At least, recent announcements make clear that they’re all looking to move past simple model building. I wrote last month about Everstring’s expansion to the world of intent data and account based marketing. 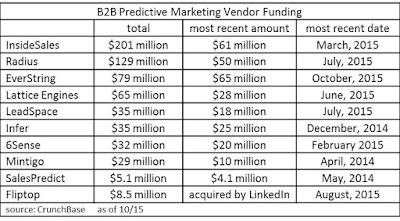 The past week brought three more announcements about predictive vendors expanding beyond lead scoring. 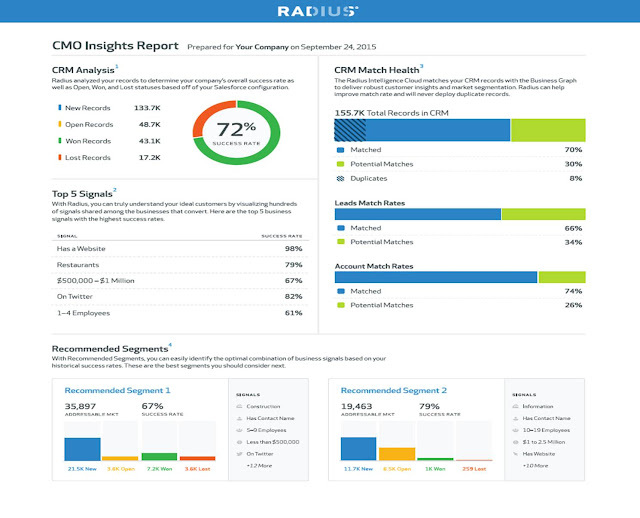 Radius kicked off the sequence on November 3 with its announcement of Performance, a dashboard that gives conversion reports on performance of Radius-sourced prospects. What’s significant here is less the reporting than that Radius is moving beyond analytics to give clients lists of potential customers. In particular, its finding new market segments that clients might enter – something different from simply scoring leads that clients present to it or even from finding individual prospects that look like current customers. This isn’t a new service for Radius but it’s one that only some of the other predictive modeling vendors provide. Radius also recently announced a very nice free offering, the CMO Insights Report. Companies willing to share their Salesforce CRM data can get a report assessing the quality of their CRM records, listing the top five data elements that identify high-value prospects, and suggesting five market segments they might pursue. This is based on combining the CRM data with Radius’ own massive database of information about businesses. It takes zero effort on the marketer’s part and the answer comes back in 24 hours. Needless to say, it’s a great way for Radius to show off its highly automated model building and the extent of its data. I imagine that some companies will be reluctant to sign into Salesforce via the Radius Web site, but if you can get over that hurdle, it’s worth a look. 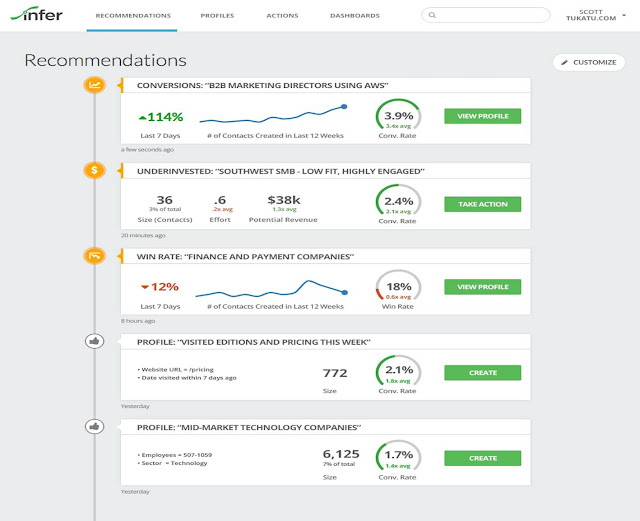 Infer upped the ante on November 5 with its Prospect Management Platform. This also extends beyond lead scoring to provide access to Infer’s own data about businesses (which it had previously kept to itself) and do several types of artificial intelligence-based recommendations. Like Radius, Infer works by importing the client's CRM data and enhancing it with Infer's information. The system also has connectors to import data from marketing automation and Google Analytics. It then finds prospect segments with above-average sales results, segments that are receiving too much or too little attention from the sales team, and segments with significant changes in other key performance indicators. Like the Pirate Code, Infer's recommendations are more guidelines than actual rules: it’s up to users to review the findings and decide what, if anything, to do with them. Users who create segments can then have the system automatically track movement of individuals into and out of segments and define actions to take when this occurs. The actions can include sending an alert or creating a task in the CRM system, assigning the lead to a nurture campaign in marketing automation, or using an API to trigger another external action. Infer plans to also recommend the best offer for each group, although this is not in the last week’s release – which is available today to current clients and will be opened to non-customers in early 2016. That last option is an interesting extension in itself, meaning Infer could be used by marketers who have no interest in lead scoring. Mintigo’s news came today. 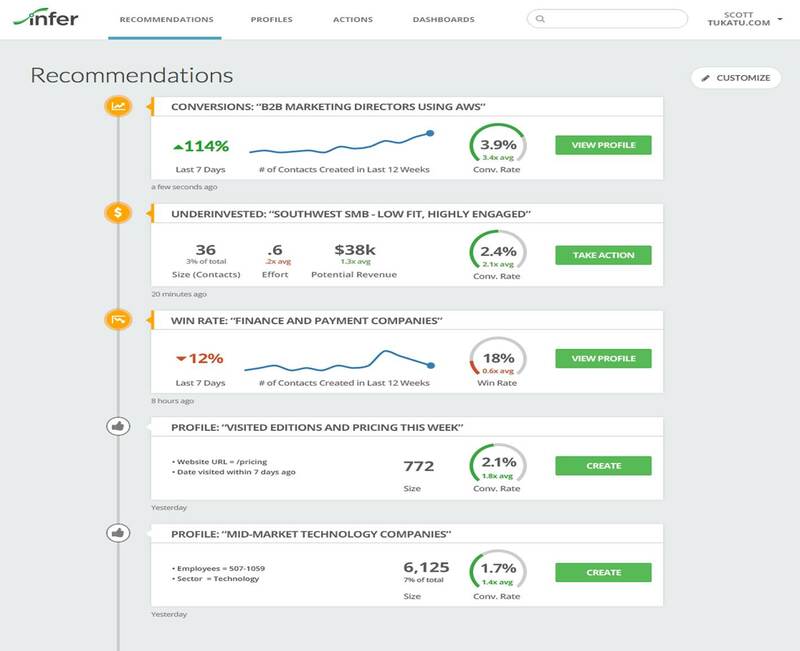 It included some nice enhancements including a new user interface, account-based lead scores, and lists of high-potential net new accounts. 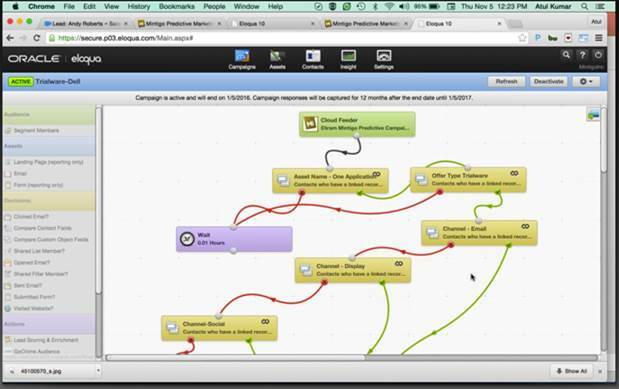 But the really exciting bit was preannouncement of Predictive Campaigns, which is just entering private beta. This is Mintigo’s attempt to build an automated campaign engine that picks the best treatment for each customer in each situation. I've written about this sort of thing many times, as recently as this July and as far back as 2013. Mintigo’s approach is to first instrument the client’s marketing efforts across all channels to track promotion response; then run automated a/b tests to see how each offer performs in different channels for different prospects; use the results to build automated, self-adjusting predictive response models; and then set up a process to automatically select the best offer, channel, and message timing for each customer, execute it, wait for response, and repeat the cycle. Execution happens by setting up separate marketing automation campaigns for the different offers. These campaigns execute Mintigo’s instructions for the right channel and timing for each prospect, capture the response, and alert Mintigo to start again. The initial deployment is limited to Oracle Eloqua, which had the best APIs for the purpose, although Mintigo plans to add other marketing automation partners in the future. 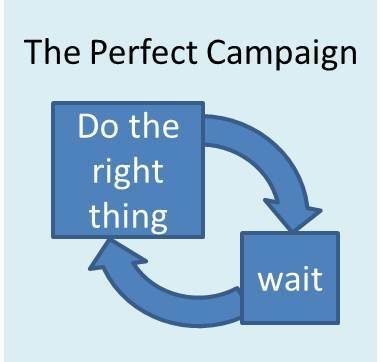 Conceptually, this is exactly the model I have proposed of “do the right thing, wait, and do the right thing again”. Mintigo’s actual implementation is considerably messier than that, but such is the price of working in the real world. There are still nuances to work out, such as optimizing for long-term value rather than immediate response, incorporating multi-step campaigns, finding efficient testing strategies, automating offer creation. And of course this is just a pre-beta announcement. But, it’s still exciting to see progress past the traditional limits of predefined campaign flows. And, like the other developments this week, it’s a move well beyond basic lead scoring.